Up to 1.4 million children around the world took part in a global climate strike on Friday to demand world leaders do more to address the dangers of climate change. The mass protests were sparked by 16-year-old Swedish climate activist Greta Thunberg, who has skipped school every Friday to sit outside the Swedish parliament to demand leaders act on climate change. Democracy Now! was in the streets of New York City on Friday with the young activists. We speak with 18-year-old Alysa Chen, one of the organizers of the walkout at New York City’s Bronx High School of Science. ALYSA CHEN: I want Mayor de Blasio to recognize that we have a voice in this, that we have the ability and the passion and the will to really move this forward and solve the climate crisis, because if — you know, politicians today are not addressing this, and those are the ones in office right now. We are the ones who want our voices heard. The mass student walkout reveals what is at stake for a generation determined to fight for a livable future. 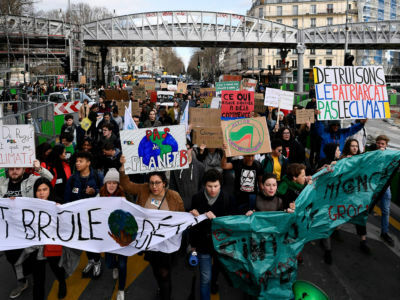 Young people across the world are striking to draw attention to the ravages of climate change. A growing movement of young people are demanding that policymakers take urgent and radical steps on climate.